This is the first Zorro film of the sound era, made by Republic Pictures, a minor studio best known for cranking out twelve-part serials. In an astounding splurge, this film was shot in full color, a rare thing in the mid-thirties. The story was “from an idea by Johnston McCulley,” Zorro’s creator, and was written and directed by Wells Root, who the following year would script the Ronald Colman version of The Prisoner of Zenda. As we’re told before the movie begins, Zorro had been leading a Native American revolt against Spanish oppression but was captured, and thus starts the movie in captivity, on his way to the scaffold for execution. (It’s like an Elder Scrolls videogame!) Spoiler: he escapes. The film is a typical low-budget Republic production, color notwithstanding: it looks cheap, the direction is shoddy, and the acting is uniformly terrible. Much of it is played for laughs, but the jokes fall flat. 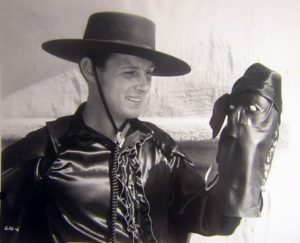 Zorro/Don Diego de Vega is played by a handsome nonentity with no discernible talent named Robert Livingston. No, I never heard of him either. There’s an impostor Zorro, a weak murder mystery, a bullfight, a pallid romance, a lot of dusty galloping, and some truly feeble stunts in imitation of Doug Fairbanks. To be fair, B-list actress Heather Angel does a passable job as the female love interest, and there are a couple of laughs from an Austrian commandante character played by German comic actor Sig Rumann, better known for chasing the Marx Brothers around opera houses and race tracks. Everything else is just embarrassing.